The past few weeks I have been trying to find addresses of all the people that have been involved in making the advertisement records, about which Dolf Hell, Pim Reinders and I am making a book + 2 CD’s + a Top 100 on a website. Most of these people are long dead, so we mainly look for the addresses of the people who take care of their copyrights. The reason why we need the addresses of these people, is to ask them if we can use their work. I don’t know the exact way that things are arranged, but what I am told is that we loose the subsidy if this isn’t done very soon. The subsidy, which Pim managed to get for this project, is for paying the money to the Buma/Stemra. Everybody who publishes a CD has to pay the Buma/Stemra. What pisses me off to no end is the idea that we pay money which is meant for specific artists, but when we ask for the addresses of these artists, they don’t have them! My first idea was to make a torrent file of all the advertisement records that I have, including scans of all the artwork. A book,CD’s and a Top 100 on a website is of course a much better plan, but so far I have spend much more time and energy on trying to find addresses than on writing! It is even worse: my lust for writing this book, which Dolf and I are supposed to finish before September this year, is completely gone because all of this nonsense! At least three times a day I think: f*ck ‘m, screw the project, I make the Torrent file! But that is not my style, and it will also create much more and bigger problems. I have promised myself never ever to do anything ever again ever that involves publishers, copyrights and whatever people or organisations who asks efforts from me that have nothing to do with the creative part. From now on I do everything on my own terms, in my own way, or not. Here is an advertisement record that is not in the Top 100 that Dolf and I made up. The Boron-tune is truly awesome. If the rest is half as good I will be a happy man. 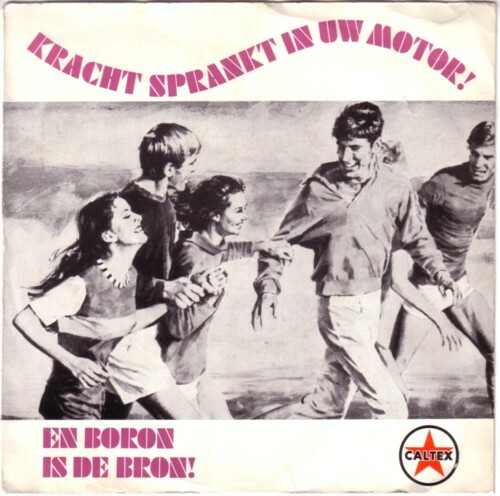 On a sidenote: I think most of those tunes are sold, that means in this case that Boron was free to use the tune without paying Buma/Stemra.